by Brianna Crandall — November 2, 2018 — Nearly three in five Americans (57%) believe paper towel dispensers in public restrooms usually waste more product than necessary, according to a recent survey commissioned by Sofidel, a global provider of paper for hygienic and domestic use. The survey, conducted online by The Harris Poll August 17-23, 2018, among 2,038 US adults, also revealed how many Americans admit to using more paper towels than necessary. The overuse of paper towels is a common occurrence in public restrooms today, as many dispensers aren’t designed to curb waste. When restroom guests take more paper towels than is necessary for effective hand drying, the cost of day-to-day operations and restroom maintenance increases. This simple problem can be easily addressed with a product that limits paper towel use to one sheet per pull. The survey also found that about one in four Americans (24%) say they take more paper towels than needed when using paper towels to dry their hands in a public restroom. Men are more likely than women to take excess paper towels, with 29% saying they had taken more paper towels than needed, while only 20% of women have done so. 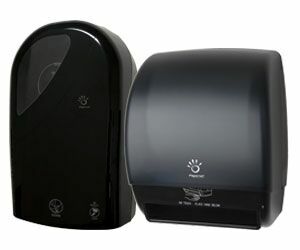 To curb restroom waste, Sofidel’s Papernet brand has introduced two new innovative dispensers. The HyTech Auto-Cut Jumbo Roll Tissue (JRT) dispenser uses a mechanism that provides customers with an individual toilet paper sheet without needing to touch the unit. The dispenser offers 15% savings compared to traditional dispensers. It is also constructed from highly resistant plastic materials, making it ideal for busy environments like healthcare, foodservice and educational facilities. The new Touchless Roll Towel dispenser uses the same mechanism to limit paper towel waste and provide 15% savings. The dispenser also features a unique paper-saving mode, allowing facilities to select the desired savings percentage (0%, 12% or 25%), set a 1-, 2- or 3-second time delay and choose the sheet length (9 inches, 12 inches or 15 inches). For more information, visit the Papernet website. If you’re looking for washroom dispensers with an elegant finish that are also easy to clean and maintain, check out Kennedy’s new collection September 17, 2018 In "Products and Services » Restroom Equipment and Supplies"